Rabbits are a joy to own, but they are not an ‘easy-care’ pet option. 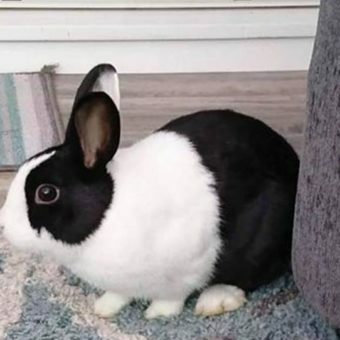 We are keen for our bunnies to go to new, loving homes; but it is equally important to us that our prospective new owners fully understand the responsibility which goes with offering a pet a new home. If you are interested in owning, adopting or fostering a rabbit, please take a few moments to read the information provided to assess whether you feel you can provide for all the needs of a rabbit. Pet rabbits can be taught to respond to commands using positive reward-based training and can also be house-trained. How often do Rabbits breed? A single female rabbit, a ‘doe’, can produce approximately 30 young in a single breeding season and can become pregnant again within hours of giving birth. How fast do rabbit's teeth grow? How does a rabbits digestive system work? Rabbits feed on large quantities of low quality food. To extract as much goodness as possible from the food, rabbits perform a digestive process called caecotrophy. Food is passed through the gut and special droppings, called caecotrophs, are produced. Rabbits eat these caecotrophs, allowing the food to be re-ingested. Group living is beneficial for wild rabbit survival. Rabbits are territorial animals and form complicated social structures. Wild rabbits live in large groups within warrens, which are divided into small family units of two to eight individuals, with a common group being a male and female pair. Why do rabbits live in burrows? Wild rabbits dig lots of underground inter-connecting tunnels called ‘burrows’ or ‘warrens’, which can cover more than two acres of land. Warrens can house 50 or more rabbits. A rabbit’s main mode of communicating is via scent. They deposit faeces, squirt urine and chin mark to communicate with other rabbits. Rabbits also use different body postures and vocalisations to communicate. However, their vocalisations are very quiet to avoid detection by predators. Rabbits have long, powerful hindlegs that allow them to achieve speeds of up to 50 miles per hour for short bursts. If chased they use quick, irregular movements to help them confuse and out-manoeuvre predators. Why are rabbits called prey animals? What family does the rabbit belong to? Rabbits belong to the Lagomorph order. Lagomorphs are herbivores (feeding exclusively on plants) and include rabbits and hares.